I could use some help on this one: I bought this model in NYC a few years ago. It's a beauty and is eaxactly like the Japan-made FT570 Jumbo shown in a 1974 catalog I found on the web. Trouble is, while it has the "traditional" blue label inside, reading" Epiphone Incorporated. Kalamazoo, Michigan. Made in Japan," the serial no. space is blank and there is no SN anywhere to be foiund on the guitar? 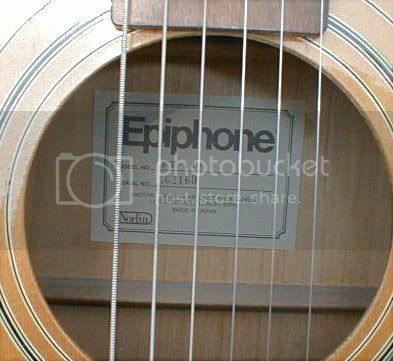 The only other place for a serial number is on the black plate on back of the guitar up by the neck. I believe, even though these upscale models had a heel, the necks were bolt-on. The four #12 screws that held the neck on are below this black plastic plate. Some had a white patch where a "serial number" was stamped. Some never were serialized. Probably after so many years of puting numbers on these FT Epis that were anything but serial. These Norlin Epis are usually dated by description. Having said that. If it is an original label, which it probably is, the blue label, MIJ suggests it is from 1970 - 1974. If that is the case and there is no serial number, it was probably made closer to 1970, an early Norlin production, as early on I don't think Aria, the Japanese manufacturer, felt serializing was necessary. My FT145SB, delivered by Santa in about 1974 had a black plate with a number stamped on the white patch. Alas, this plate has long ago been lost. 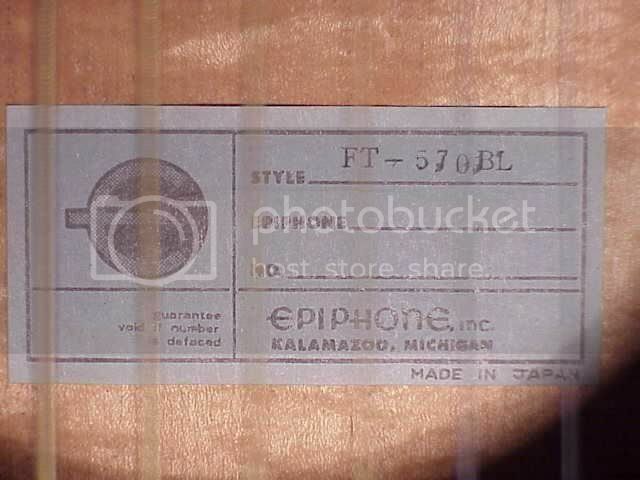 This appears to be exacly the FT570-BL in the '74 Epi catalog you can find on the web. No black plate. No visible serial number. The neck is glued, but it does indeed have the block inlays. Not familar with "Norlin" but I do recall "Aria" from back in the day. When Gibson fell on hard times in the late 1960s, a company from Brazil, Norlin, a manufacturer of cement and beer, bought Gibson. In the early 70's if not late months of 1969, Norlin sent the Epiphone production to Aria in Japan. Made in K'zoo labels, blue and small were copied by Aria for application to these early models. Later, after 1974ish, a larger, almost square label of tan.. possibly white, was made which specified "Norlin" in the lower left corner. Check these current Ebay offerings to see what I mean. FT130, Early Norlin blue label Note "Made In Japan" This lower margin is sometimes razored off by unscrupulous sellers trying to pass them off as K'zoo made. Sometimes, the corner is merely torn off. As far as the glued on neck / dovetailed. I won't argue that. I was fo the understanding these were bolt-ons like the others. I myself would love to have one of these 570s, especially bursted one to match my 145SB. Alas, finding one when I have the cash available hasn't come to pass. Yeah, it's a three-piece neck (four actually) made of birch, the catalog says. And the label is true blue and small. I've got mine on E-bay! "FT" is simply flat top? and the serial numbers were on foil or paper labels at the headstock and went missing within the first few months...very rarely did the serial number appear on the labels of the FT-570 which came in the BL for natural blond version and SB version was the sunburst. They're usually obscenely over-priced when they do come up on E Bay....they're worth maybe..if in good shape with no neck separation issue $225-$250 but people ask twice that and more...you can find a far superior modern acoustic with solid woods for $500 and these have no collector premium and they are completely laminated construction and they do have issues..Later versions have a pointed heel and are less likely to separate but most of them have the troublesome rounded heel. Mr. Nelson - (Ozzie?) 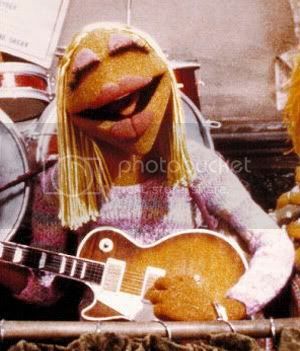 - I do not have much expertise here, but I DO have this exact guitar! 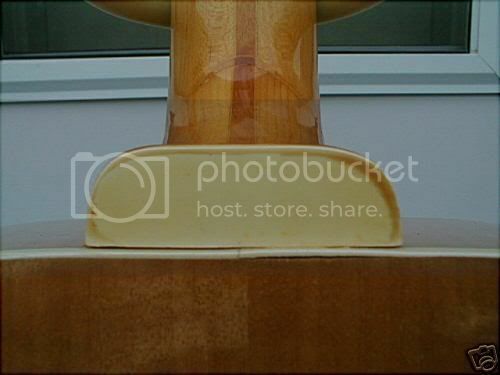 The neck heel is exactly as pictured, w/out the separation. The label appears EXACT, too. No mention of Norlin and NO SERIAL NUMBER. I'm still puzzled about one thing and, remember, I'm no luthier: there is a single octagonal nut at the end of a bolt, inside at ythe neck, which I took to be the inside end of the truss rod. No? That bolt is for the bolt-on neck...the neck won't readily come off because the body was finished after the neck was installed and the higher end of the fret board glued to the top and the glue and finish has sealed the two together but if you really want to you can make it come apart (not recommended) The truss rod is much higher up and under the fret board...and no, not Ozzie..I don't look good in cardigans lol but back in the 50's my uncle Rocky Nelson had a band called Rocky Nelson and The Stones but they couldn't play high schools because the oldsters thought "Stones" referred to drinking so they became "Rocky Nelson and The Pebbles"..but it is cool to say my uncle was once a member of the "Stones".. Pick up the bags and get in the limousine. I knew someone here knew more about these. So the 570 had a bolt-on neck somewhat like a Taylor. However given bobm's description, only one bolt. Maybe this is what the brochure means by "Fixed full heel neck." Fixed by gluing the heel, and fingerboard and securing with a bolt for good measure. This feature is parroted on the 550. Is it safe to assume that it too has the same neck 'Fixed' (with a bolt and glued fingerboard)? The 350 lists an 'adjustable' neck, which is, I believe parroted on this brochure's previous page of FT-130 thru FT-150 models. The pic of the 350 on this page shows a heel, sort of. Wonder what it looks like? I have a cousin, by marriage, I met at a family reunion once. He brought and played an Epi dread with a similar looking heel. I wonder if it had a bolted on, fixed full heel. It had a model number 400 something. Don't recall if it was FT or PR. Interesting to note, in my quest for information on Norlin and ECL, I found out something unexpected. CMI, Chicago Music Instrument (or Inc.) also owned band instrument lines, like Olds and maybe Selmer and Conn too. Mostly student grade stuff, but I found an Olds instrument board once that discussed Norlin's ownership after purchasing CMI. Somehow CMI all ties back to the Harmony Corporation, maker of "The best guitar you can buy for the money you'll spend." Largest manufacturer of guit tars in the 50's and 60's. Some say fully half of the worlds manufacture! Just thought I would let everyone know that my dad works for goodwill down here in South Texas and someone donated an FT 570. My dad grabbed it before it was put up for sale and gave it to me. haha!! It looked like it hadn't been touched in 20 years. I'm really liking it so far and all I had to do was replace the strings and work on the saddle a little bit. It sounds great! I'm happy to have found this thread as it has cleared up a great amount of confusion and wonder. I picked up what I think to be a FT570SB from a friend, who found it in a basement, sitting against the wall at a very severe angle, and time ( as well as kids continuing to tighten and retighten the strings) had caused the neck to separate from the body; a problem, I have since learned, that has plagued many a FT570 without the root causes I have just stated. The label inside the body, once blue, had either been torn off or simply fell off with age. At any rate, I got the neck repaired, both reset, glued, and then bolted on. I say "bolted on" because the neck was definitely a dove tail neck, unlike the one displayed in the pictures in another posting, and the bolt installed by the luthier who repaired the guitar was definitely an addition, not a replacement. Was the FT570 ever produced with a regular dovetail, glued on neck, or am I now only 75% sure of exactly which guitar I own? As you can see by the pictures, it looks like a FT570SB, with the exception of the neck heel. Any information would be greatly appreciated. This guitar, regardless of where/when it was made and what it may be selling for in the "real world," outplays and sounds better than any guitar I have ever owned. "..Later versions have a pointed heel and are less likely to separate but most of them have the troublesome rounded heel." This might be older than the Norlin 'troublesome heel' variety. 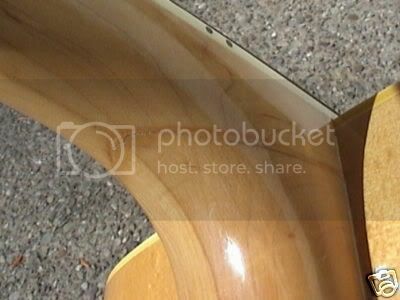 As I understand it the heeled bolt-ons had the bolt heads visible through the sound hole. The blue label also pre-dates the Norlins as it is one way of identifying a better guit tar than was made in Japan. It is unusual for someone to remove the blue label from a pre-1970's FT. Sometimes done to disguise a Norlin FT. It may have been removed by young hands, not knowing any better. Also, the moustachioed end of the fretboard isn't usually seen on this level of guitar (Norlin FT). This might not be an FT570SB. It might be what the FT570 pretended to be. You might have something older and maybe better than the Norlin era FTs. Keep digging. 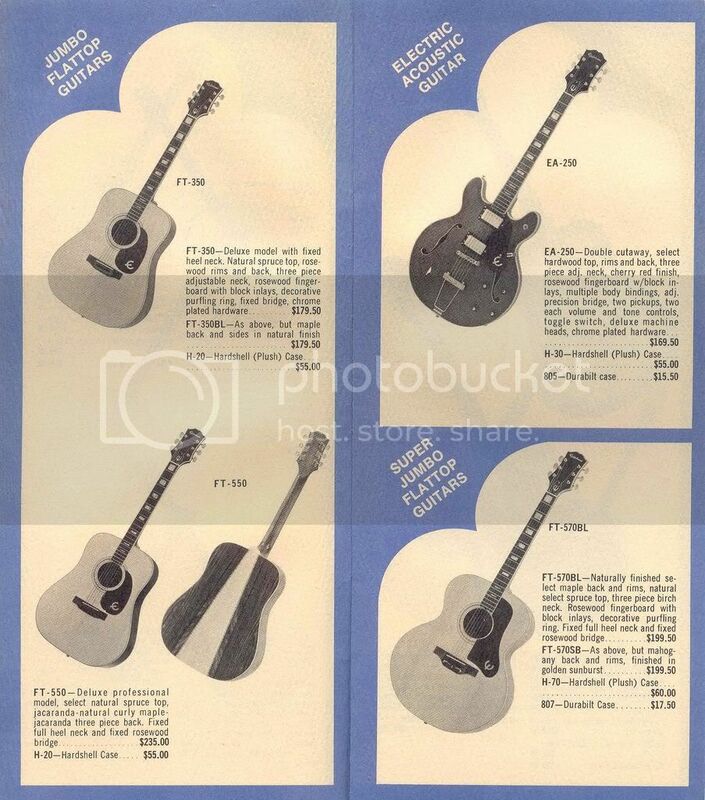 What you are looking for is, likely, a 60's Epiphone version of a Gibson Super Jumbo (SJ)... I'm not real familiar with these. BTW, you are not intruding. You left pictures. Thanks very much for the info! I will certainly keep digging. I'll let you know what I find, if anything.